Ryan; Gibson, Brennan, Paisley, Frost; Guy (O'Connor 70), Ndo, Fahey, Kirby (O'Neill 74); Quigley (Barker 70), Fitzpatrick. While the title challenge of St Patrick's Athletic is fading rapidly, Longford's battle to avoid the dreaded drop is gaining momentum with every passing week. They showed tremendous character to come from behind and now lie only four points adrift of Waterford at the foot of the Premier Division table. Pat's went in front after 15 minutes. Billy Gibson's right wing cross was smashed home by Mark Quigley, albeit aided by a slight deflection. This was no less than the Inchicore outfit merited, as they had been much sharper than the home side early on. John Frost and Glen Fitzpatrick also brought smart saves from home 'keeper Shay Kelly. However, much against the run of play, Longford were back level just seven minutes later, when Dave Mooney notched up his twelfth league goal of the season from the penalty spot. With their first meaningful attack, John Reilly won possession for Longford just inside the Pat's half, but was stopped illegally in his tracks by former Town player Stephen Paisley. Pat's protested that the foul occurred outside the area but referee Richie Winter had no hesitation in pointing to the spot. Pat's had a terrific opportunity to go back in front on the hour. 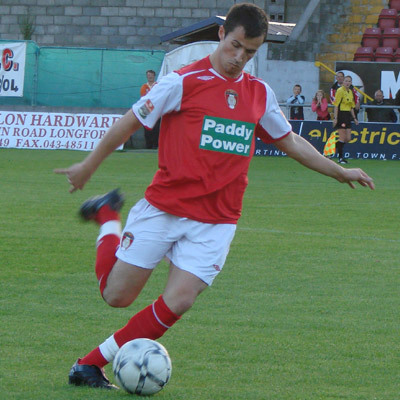 However, Keith Fahey should have done much better than shoot over after running on to Ryan Guy's superb cross. However, this sparked Longford back to life. They dominated for long periods thereafter and got a vital match-winning goal in the 67th minute when Damian Brennan bundled the ball home after good approach work from Kevin Doherty and Mark Rutherford.